Indigenous Innovations « Adafruit Industries – Makers, hackers, artists, designers and engineers! Native Americans were making STEM breakthroughs long before certain historians give them credit for. 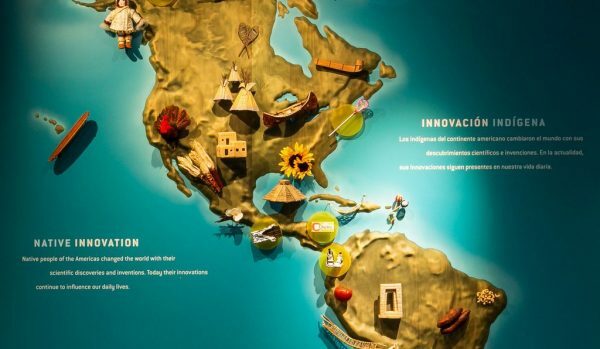 One of the first displays that kids see at the new activity center at the National Museum of the American Indian in New York City is a wall-size map of the Americas, studded with miniature versions of products that were first developed by indigenous people. A canoe hovers above the Great Lakes, corn over western Mexico, and a kayak above northern Canada. And perched over Panama is a tiny pair of canvas high-tops. Did Native Americans wear the world’s first sneakers? Not exactly. “We didn’t invent Chuck Taylors,” says Duane Blue Spruce, a museum project manager. “But we did invent the chemical processes” for making rubber. More than three millennia before Charles Goodyear gets credit for inventing vulcanization, the Olmecs were making rubber in what is now southern Mexico, in 1600 B.C. Along with later Mesoamerican civilizations, including the Maya and the Aztecs, they developed separate formulas to produce different types of rubber: strong rubber bands to strap handles onto tools, durable rubber soles for their sandals, and the bouncy rubber balls they used in their ritual ballgame, which was played for centuries in courts across a wide swath of Mexico and beyond. Spaniards arriving in the 1500s marveled at this strange material and described the technology for processing it: latex drawn from the local rubber trees was combined with the juice of morning glory vines until it coagulated into rubber.